Political walkouts, dealing with legacy issues and flying home for Christmas all feature in Friday's papers. It is said that lightening doesn't strike twice - but how about three times? Well, that is exactly what happened to a masterpiece which is now hanging in Belfast's Ulster Museum. The painting, by Dutch master Jacob van Ruisdael, was stolen three times - most recently in 1986 by by notorious Dublin criminal Martin Cahill. The Belfast Telegraph reports that security will be keeping a close eye on the 17th century artwork. Anne Stewart, a senior curator of art with the Ulster Museum said her staff had gone to "great lengths" to ensure it stays on the wall! 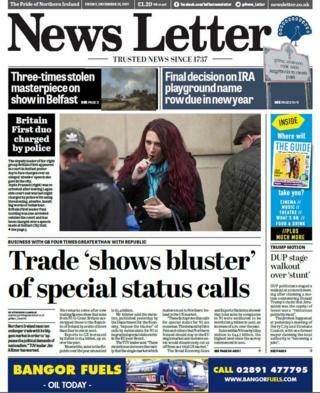 The News Letter reports on a walkout by DUP officials at Derry City and Strabane Council on Thursday evening. It followed a motion condemning as a "ridiculous publicity stunt" Donald Trump's claim that Jerusalem is the capital of Israel. It was proposed by Independent councillor Gary Donnelly, who said Mr Trump's decision "recklessly ignores" the warnings of the international community. The DUP's Hilary McClintock said the motion overstepped the council's remit. "We are becoming a joke by our lenient interpretation of standing orders which continues to allow some members to seek publicity," she said. "The DUP have had enough of it. This is a ridiculous publicity stunt and we are leaving the chamber now, and it just remains for us to wish you all a merry Christmas." Chief Inspector George Hamilton has sent a letter to the relatives of about 120 victims of the Glenanne gang in which he claims he has been put in "an impossible position", reports the Irish News. The Historical Enquiries Team (HET) investigated the murders between 1972 and 1978, but the unit was disbanded before a report was released. Last week the paper published an appeal to the PSNI chief calling for him to abide by a court ruling and order an independent investigation. Mr Hamilton has responded that political disagreement on legacy issues and budget cuts have left him with few options. "The High Court has found that while I have a legal obligation to investigate the circumstances of the Hillcrest bombing and other related cases, my organisation is not sufficiently independent to conduct that investigation," he said. "It is in the public interest that clarity is sought from the Court of Appeal as to what the law permits or requires the PSNI to do in relation to investigating the past." 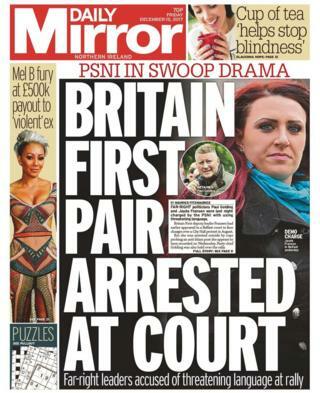 The charge of two Britain First politicians for separate incidents in Belfast make the front pages of the News Letter and the Daily Mirror. The leader of the far-right group, Paul Golding, 35, faces charges relating to speeches made at a Northern Ireland Against Terrorism rally on 6 August. Charges against deputy leader Jayda Fransen, 31, relate to an incident at a peace wall in Belfast on 13 December. Ms Fransen is due to appear in court later, while Mr Golding will appear on 10 January. A Gaelic footballer from Tyrone has heard good news that he is well enough to fly home for Christmas, four months after being hit by a car in the US, the Irish News reports. Twenty-two year old Aaron Elliot, who moved to America to play for Kevin Barry's GFC in Philadelphia, said he felt "humbled" by the generosity of those who helped him pay for medical bills. The Clonoe man suffered head injuries, a collapsed lung and a shattered elbow when he was hit by a car. "I feel a lot better compare to how I was," he told the paper. "Football is the last thing on my mind at the minute. "I do hope to go back. Maybe next year. I don't know. We'll see."